Ernie C'deBaca is President & CEO of the Albuquerque Hispano Chamber of Commerce (AHCC). Ernie began in that capacity in June 2017 having served prior as the Vice President of Conventions and Tourism for the chamber. Ernie retired from PNM Resources in January 2016 having worked there for 38 years and serving the past 20 years as its Vice President of Governmental Affairs. Ernie was also a long-serving Board Member at the Chamber and was its chair in 2006. 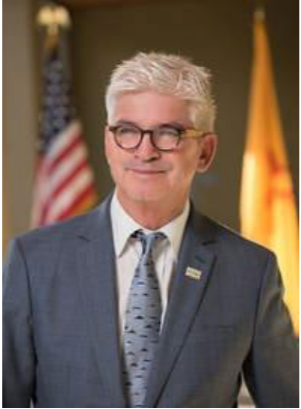 In his current capacity, Ernie leads the AHCC which is the largest chamber in New Mexico and the largest Hispanic Chamber in the United States. The mission of the chamber is to promote economic development, to enhance economic development opportunities and to provide business and workforce education with an emphasis on the Hispanic and Small Business Community in Albuquerque and New Mexico. Ernie also has previously served on boards of the United Way, National Hispanic Cultural Center, the Utilities Executives for Change (University of Idaho) as well as the Bernalillo County/City of Albuquerque Unification Charter Commission. Ernie is married to his beautiful wife, Geri for 42 years, has two sons, Rob and Seth a daughter-in-law Ali and grandsons Grady and Quinn.